Thank you. Thank you for, first, for even being here at my blog at all. I know fewer and fewer people read blogs, preferring sound bite analysis and catchy headlines on social media. I do that, too, at times. As such, I am always appreciative when anyone takes the time to jump from a tweet or a shared link or maybe even RSS reader to come and spend a few minutes with my writing or my songs, and maybe even write a comment. Thank you for your conversations in the comment bin, when you have time and inclination to do so. I am also deeply appreciative of the fact that while I read about and know about the thorny, messy elements of the Web — the way trolls play out on Twitter, the way algorithmic bots target us on Facebook (well, not me, but maybe you), the way we are the product for marketing, the way dark corners of the Net are home to anger and conspiracy and such — I have mostly avoided those elements. I know others have not been so lucky, targeted because they speak out and have strong views. I think my positive bubble — which is not the kind of bubble that walls me off from the world and not the kind that stops me from expressing my own strong opinions nor engaging in debates — has been mostly due to you. You have helped me stay positive and engaged in thinking forward. I ask you questions, and you answer. I remix your resources, and honor your work. You do the same, with mine. I write in your margins, to better understand. I write my way forward. Sometimes, I read what you share and let it sink in, letting time follow me until I realize that what you shared with me is now the thing I need right now. You knew that all along. This is not, alas, unbridled optimism without worry, of course, worries about the many obstacles still there when it comes to learning and teaching and writing and sharing and connecting, and the myriad of troubles that come with this digital world. For sure, there are unsettling problems, made worse by our digital connections with the world. I find myself agreeing with the analysis by many that the promise of the Web, as we know it today, is not what we thought it might be. Still, it might yet still become something else altogether, something better. We collectively push forward by pushing forward, we do by doing, we make by making, and we can do this together. No one person can be on this journey alone. We make this path, together. Whenever I think, this is a perfect opportunity for a collaboration and let’s get an invite out into the networks, that impulse to work with others in technology and writing and making is based on hope in the possible. It’s why I remain part of CLMOOC, and why offshoots of connected communities intrigue me. It’s why others in the National Writing Project seem like friends, even when we only just meet. It’s why I found a new-ish home on Mastodon, settling into small stories and small poems and small sharing. This is why regular activities like Slice of Life remain a draw for me. It’s why I don’t worry too much about leaving one place to go to another, to meet new people, to learn from others. I dip my toes, for a reason. There are more people out there who want the same than we realize. It’s sometimes just a matter of finding us. I am thankful there are such opportunities. Thank you. 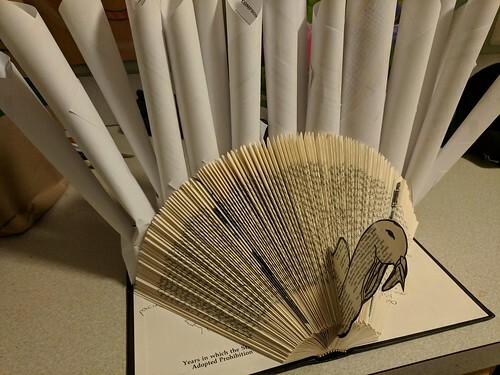 This entry was posted in Homepage, Making Learning Connected MOOC, Mastodon, nwp, Slice of Life. Bookmark the permalink. I’m thankful for the same things and for how well you share these ideas.